© 2010, American Heart Association. All rights reserved. 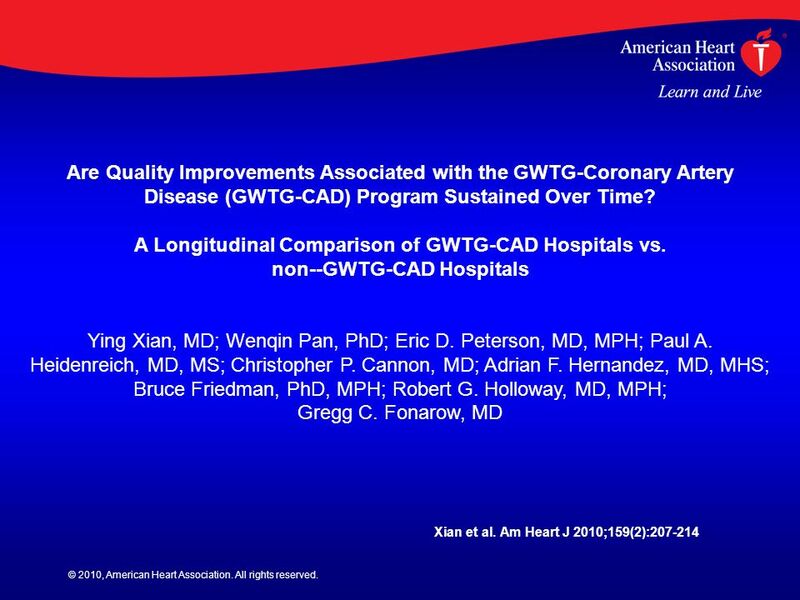 Are Quality Improvements Associated with the GWTG-Coronary Artery Disease (GWTG-CAD) Program Sustained. 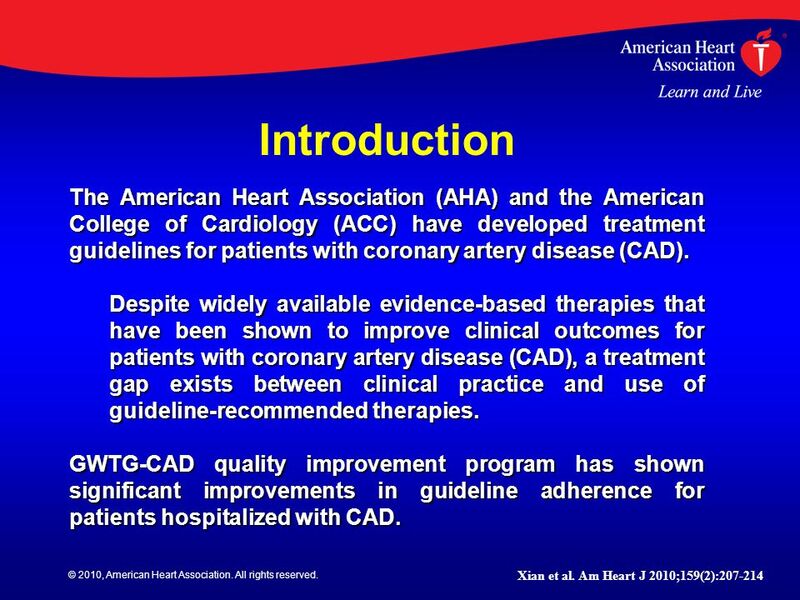 Download ppt "© 2010, American Heart Association. All rights reserved. 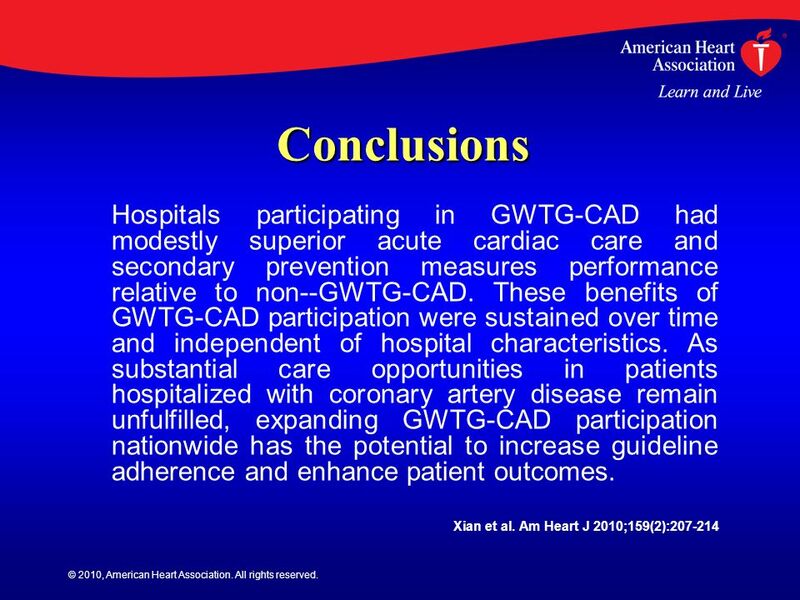 Are Quality Improvements Associated with the GWTG-Coronary Artery Disease (GWTG-CAD) Program Sustained." © 2010, American Heart Association. All rights Association of Hospital Primary Angioplasty Volume in ST-Segment Elevation Myocardial Infarction With Quality. © 2010, American Heart Association. All rights reserved. 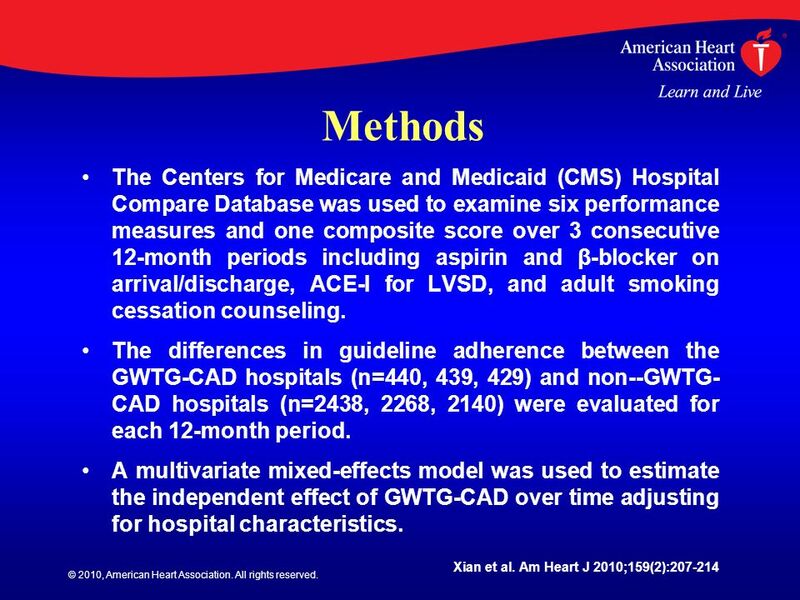 A Validated Risk Score for In-hospital Mortality in Patients with Heart Failure from the American. © 2010, American Heart Association. All rights reserved. Evolving Patterns of Use and Appropriateness of Aldosterone Antagonists in Heart Failure Nancy. The Golden Hour and Acute Brain Ischemia: Presenting Features and Lytic Therapy in Over 30,000 Patients Arriving within 60 Minutes of Onset at GWTG-S.
Hernandez et al. JAMA, May 5, 2010 – Vol. 303, No. 17 Relationship Between Early Physician Follow-up and 30-day Readmission Among Medicare Beneficiaries. 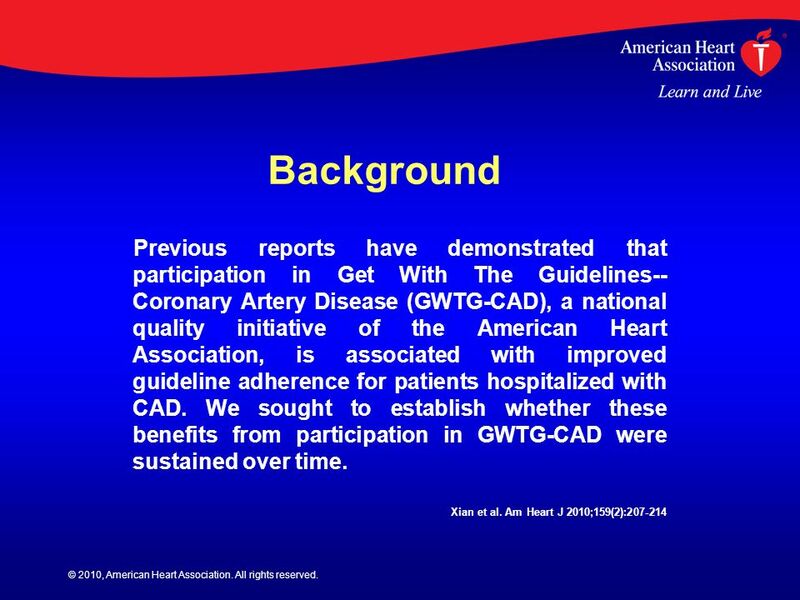 Is Participation in Get With the Guidelines-Resuscitation Program Associated with Improved Quality of Cardiac Arrest Care? Monique L. Anderson, MD, Graham. Connie N. Hess, MD, Bimal R. Shah, MD, MBA, S. Andrew Peng, MS, Laine Thomas, PhD, Matthew T. Roe, MD, MHS, Eric D. Peterson, MD, MPH Relationship of Early. 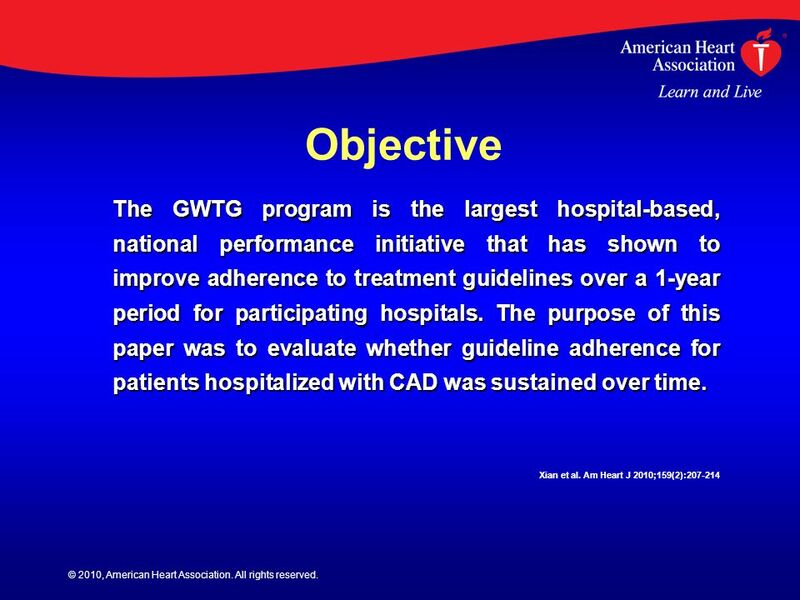 DISCLOSURE INFORMATION (relative only): Eric D. Peterson, PI of the AHA GWTG Data Analysis Center; Lee H. Schwamm, Chair of the AHA National Steering Committee. Cohen et al. Circulation. 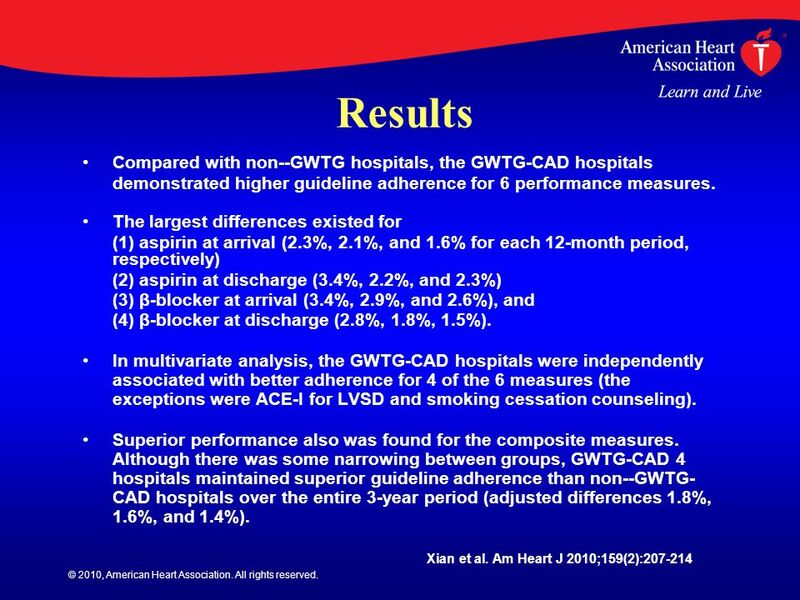 ePub May 17, 2010 Racial and Ethnic Differences in the Treatment of Acute Myocardial Infarction Findings From Get With The Guidelines. 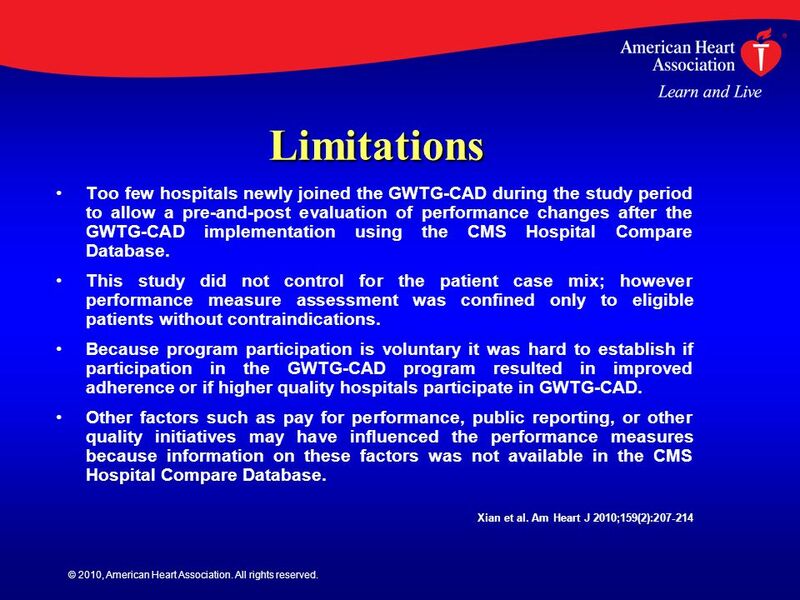 Regional Differences in Quality of Care and Outcomes for the Treatment of Acute Coronary Syndromes: An Analysis from the Get With The Guidelines Program. 0 Hospital Quality Incentive Demonstration (HQID) Key Facts Three year demo ( ); extended for three additional years through Oct hospitals. Alexander 2004 CMS-Premier Hospital Quality Incentive Demonstration Project Stephanie Alexander Senior Vice President Premier Inc. Healthcare Informatics.